Mobility Services Becoming More Popular as Alternatives to Vehicle Ownership, According to Cox Automotive Study - Cox Automotive Inc. The 2018 Cox Automotive Evolution of Mobility Study: A Shift Towards Alternative Ownership is the second chapter in a multi-part research effort focused on how consumers and dealers are thinking about the changing mobility landscape. The research shows consumer acceptance of the many technology-driven mobility solutions (e.g., ride-hailing, car-sharing and subscription services) are beginning to supplement or replace traditional vehicle ownership. Facing higher vehicle ownership costs, more consumers are looking to smart, technology-driven solutions that provide easy and cost-effective mobility. ATLANTA, August 23, 2018 – The automotive industry’s predictions on the future of traditional vehicle ownership remain a topic of debate and at times a guessing game. Ultimately, awareness, availability and acceptance of on-demand transportation options, such as car-sharing, ride-hailing and subscription services, will likely be the deciding factor. 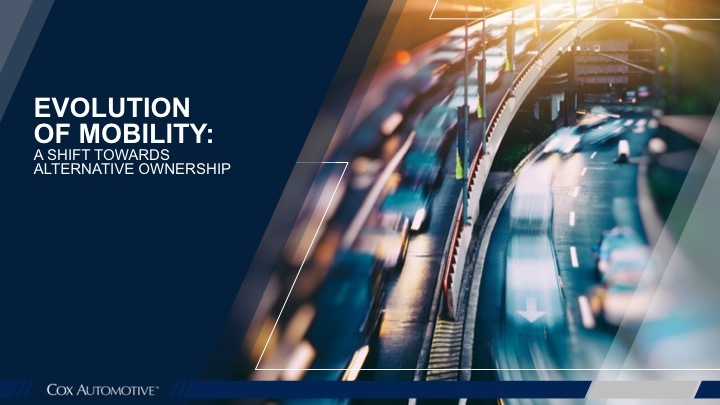 The uptake of vehicle ownership alternatives is transforming the way consumers view mobility according to the 2018 Cox Automotive Evolution of Mobility Study on Alternative Ownership. The study found that consumers’ attitudes about the necessity of vehicle ownership are gradually changing. Access to mobility is necessary but owning a vehicle is not, according to 39 percent of respondents, which represents a 4-percentage point increase over 2015 results. For urban consumers, 57 percent indicate access to mobility is more important than vehicle ownership, a 13-point increase since 2015. The cost of owning or leasing a vehicle also is perceived to be becoming too high by 48 percent of respondents. This means increasingly more consumers are prioritizing technology solutions that provide easy and more cost-effective mobility over traditional vehicle ownership. Today’s consumers continue to rely overwhelmingly on vehicle ownership as their primary mode of transportation and love the freedom (81 percent) and convenience (89 percent) associated with it. This, however, is not particularly true with younger cohorts, as 55 percent of Generation Z, 12-22-year-old respondents, and 45 percent of Millennial, 23-36-year-old respondents, feel transportation is important, but owning a vehicle is not. Whereas 34 percent of Generation X, 37-53-year-olds, and 28 percent of Baby Boomers, 54-72-year-olds, feel the same. Various business models such as ride-hailing and car-sharing are gaining traction, as are new subscription or flexible lease options. Automakers like BMW, Mercedes-Benz, Porsche and Volvo and mobility companies like Clutch and Flexdrive are growing an ecosystem of fleet vehicles, where commercial owners hold the asset and charge consumers for usage. Usage and awareness of ride-hailing has hit the mass market with 88 percent of respondents aware of this mobility option regardless of where they live, and with more than half of Millennials (55 percent) using this service. Car-sharing has experienced slower, pocketed growth with awareness at 54 percent including a quarter of Millennial adoption. Lack of widespread adoption is due in part to car-sharing being significantly less accessible than other alternative transportation methods. In urban areas where car-sharing is most prominent, only 44 percent of consumers find it accessible versus the 85 percent of consumers that find ride-hailing accessible. The car-sharing space also is fragmented with many players, giving consumers a lot of different options and leaving no clear leaders in usage. Ride-hailing is less crowded, with Uber (30 percent) and Lyft (18 percent) as the clear front-runners in terms of usage among respondents. The newest alternative ownership model is car subscription services, described to consumers taking the survey as a service that gives you control of a vehicle (similar to leasing), but also offers the ability to swap your vehicle weekly or monthly. Users pay a one-time membership fee and a subscription payment for their vehicle access (either weekly or monthly) that includes all expenses except gas (such as insurance, maintenance, roadside assistance). While only beginning to gain traction and currently only available in select markets, 25 percent of consumers (18-64 years old) have heard of car subscription services. Comparable to car-sharing, it is most appealing to young males and new-vehicle buyers, with 10 percent of consumers indicating they would be open to a vehicle subscription service instead of purchasing or leasing a vehicle the next time they are in the market. Access to the latest technology is the key draw to subscription services (44 percent) — worry-free maintenance (36 percent), the ability to swap vehicles based on your needs (35 percent), and flexibility (35 percent) also are strong benefits. With the large growth opportunity that exists in mobility, Cox Automotive recently announced the formation of its Mobility Solutions Group. The new business division will focus on developing and investing in solutions that will fuel new models for consumer mobility and enable fleet management solutions for its partners and clients. Additionally, Cox Automotive announced the acquisition of Clutch Technologies, which joins Flexdrive, Getaround, Ouster and Ridecell as companies that Cox Automotive has invested in. This study was conducted by Vital Findings on behalf of Cox Automotive and included 1,250 consumers in the U.S. participated in an online survey during May 2018. Results were weighted as needed for age, gender and race/ethnicity; a full methodology is available. This document provides a detailed overview of key study findings.